So I took that trip the very last day of my stay in the Emirates with my parents and thanks to my fantastic colleagues we went straight to the SKY. The tower is located in Dubai Downtown and has a sleek steel and glass look. The design was inspired by a desert flower Hymenocallis and Islamic architecture. The construction started in January 2004 and the tower has been officially opened in January 2010. Inside, there are residences, Armani Hotel, restaurants, fitness, car park and other. Yet, the architects originally forgot to plan for one particular world record – the highest outside observation deck in the world. Burj Khalifa’s public observation deck was placed on Level 124 and 452 m above ground. As such, the deck became “only” the third highest in the world. It was surpassed by an observation deck in the Canton Tower in Guangzhou, China at 488m and the second place was taken by a 55m long glass bridge Skywalk 100 up at 474 m above ground in the Shanghai World Financial Centre. Needless to say that some people were not happy about this and there were several plans how to gain the crown for the highest observation deck. One idea was connected with the award of Expo 2020 organisation to Dubai and that was to build a new tower “Burj 2020” near Jumeirah Lakes Tower in Dubai Marina area. 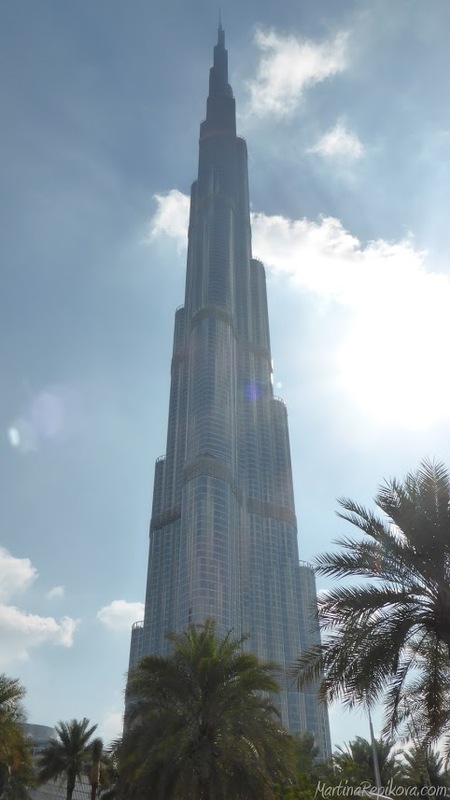 But the management of the Burj Khalifa came with a much simpler and cheaper idea and in October 2014 opened a “premium luxury SKY lounge and observation deck” at Level 148 (555m above ground) and thus increasing the already impressive count of the Guinness world record the tower holds. 124 or 148? That is the question. The new deck is called “At the Top SKY” and the entrance is from the lower ground floor in the adjacent Dubai Mall. The tickets are sold online at the the Burj Khalifa website for a precise time and date and the cheaper tickets to Level 124 are usually sold out a week before the visit date. This is a fact not known to many tourists planning their trip to Dubai and it seems they either do not plan ahead or think they can miraculously get their hands on the cheaper tickets the minute they arrive to the Burj Khalifa ticket office in Dubai Mall. Every time I went passed by the ticket office, especially an hour before the sunset, I often saw panicky tourists claiming they cannot leave Dubai without visiting the tower. With the “new” deck opening, it seems they now got a chance to get there at a last minute, not minding the higher price: To get to the highest observation deck in the world, you will have to pay approximately five times more than to the deck at Level 124 holding the third (or now the fourth) place. Yet, all this comes to the detriment to SKY ticket holders who bought their tickets well in advance and were promised a “premium” experience. They might quickly give up on their “preferential treatment dream” as they experience the similar waiting lines, crammed elevators and they will have to put their small backpacks and handbags into storage, so more people can fit in the elevator (I had a feeling the “people in the elevator” limit was much more than the actual physical space in it). According to the Burj Khalifa website, you will be welcomed by the Guest Ambassadors, will be seated in a premium lounge and offered a selection of dates and coffee before being personally escorted to the elevator. Our entry was planned at 5pm, to allow us plenty of time to look around the Level 148 before descending to Level 125 to watch the sunset and Dubai’s night skyline. My parents and I arrived 30 min earlier just to be sure. There was already quite a significant queue to get not only to the level 124 but also to the SKY. As the tickets to the Level 124 were completely sold out online (as usual), the more desperate Dubai tourists were buying the more expensive tickets for the SKY experience. At the entrance, we were first turned away and told to come back in 20 min, and then, we were showed to wait standing near a wall. One guest ambassador asked everyone to place their bags into the storage, pointing significantly also on my backpack (which was really not big and mostly empty for a change). After some 15-20 min of standing, they led us around a shiny model of the tower through the security detectors to the elevators. The route took us through an interesting “tunnel” with exhibition and presentations of the construction history. At one point there was a screen with two Emirati TV anchors discussing recent base jumping record from the top of the tower. Out of three elevators, one was dedicated to bring people to Level 125 and the other two went “only” to Level 124. The elevators were pretty fast, running at 10 m/s, taking you to 456m height of Level 125 in around 100 seconds. In the elevator, there was an interesting display showing how we are passing the various tall structures in the world, Eiffel Tower included. At level 125 we changed from one crammed elevator to another to get to the Level 148. Level 148 at 555m above the ground was designed as a relatively small lounge, with a few sofas and chairs, personnel offering juice or small bites. The surface of the Level 148 was approximately a two bedroom apartment, which is relatively small for UAE standards, and it was getting more and more crowded. So we descended to Level 125 to wait for the sunset. The space there was larger, with a corner to take official pictures in front of a blue background and another place with the “Dubai – A Falcon’s Eye View ” – a multimedia presentation on the floor with google-maps-like zoom in and zoom out on on important landmarks in Dubai and in the Emirates. I felt a bit dizzy after watching it for a while. The sunset was splendid albeit faster than in Europe. Watching the “dancing fountain” from above is more fun if you’d already seen it from the ground. Unfortunately, the photos are not clear with glass reflections of the people, ceilings and fire exit signs. Any seating option on Level 125 would be very welcome especially before the 40-min queuing for the elevators to get back down to earth. During the elevator ride down there was a video played with a speech about Burj Khalifa as an example of UAE’s drive to excel. Meanwhile in “tunnel” on the way out, there was a display dedicated to Burj Khalifa’s design and architecture. After the Burj Khalifa visit, we continued to watch several performances of the Dubai dancing fountain. Watch my video on youtube. My recommendation, if you plan to visit Burj Khalifa, buy your tickets online ahead. If you can, the Sky experience is really nice one, but I would recommend you to go there earlier than we did. For more information, see also the official website of Burj Khalifa and if you prefer or have to remain in your sofa, check my photos, some general videos on youtube or watch the amazing New Year’s firework display. Thanks Balaji. 🙂 I was not so tempted to go up either, but it was really worth it.